The port of New Orleans consists out of two cruise ship passenger terminals, both located in downtown, near the Riverwalk Marketplace shopping mall and within easy reach of the Arts District and the French Quarter. Ships will dock either at the Julia Street or the new Erato Street Cruise Terminal. Book today the closest pre and post cruise hotels, cheap motels near New Orleans cruise passenger terminals. 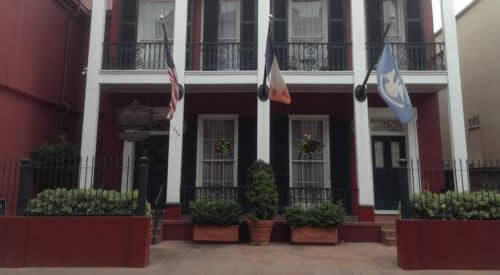 Best overnight stay nearby in French Quarter, Garden District, close to the airport. The cruise port of New Orleans is located in the downtown area, on the Riverfront Trolley line, near the Riverwalk Marketplace shopping mall which is very close the Arts District and the French Quarter. Ships will dock either at the Julia Street (920 Port of New Orleans Place) or the new Erato Street Cruise Terminal (1100 Port of New Orleans Place). If you want to stay close to the port, nearest hotels are located across the street from the Morial Convention Center in CBD, Central Business District/Convention Center. Popular are the Hampton Inn and Suites, Hilton Garden Inn and Embassy Suites. The district is right across the street from the French Quarter. A cheap taxi to the ship will take less than 5 minutes. Very popular reasonable priced hotel not far from Erato and Julia Street cruise terminals. 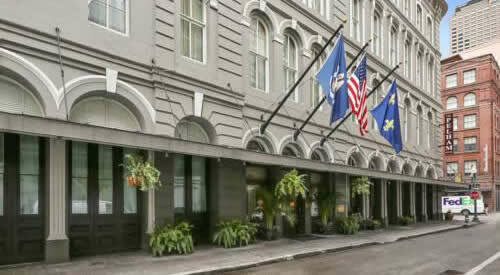 Boutique hotel located in the heart of the French Quarter, nearby Jackson Square. Mississippi riverfront hotel close to the Riverwalk Marketplace shops and restaurants. New Orleans LA Cruise Terminals — the cruise ship terminals in the heart of downtown New Orleans are all on the RiverFront streetcar (trolley) line, with two stops adjacent to the cruise terminals. 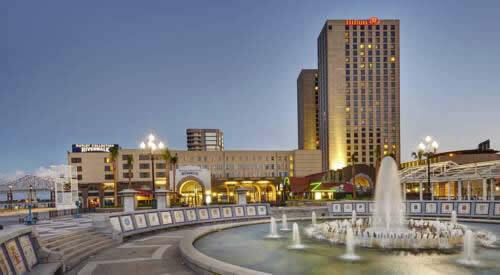 A 10 minute ride away are the Aquarium of the Americas, IMAX Theater and the French Quarter. The Julia Street embarkation complex is located within the same building as the RiverWalk Shopping Mall. The Erato Street Cruise Terminal opened in September of 2006 and is located adjacent to the Julia Street Cruise Terminal. The building includes a 1,000-vehicle parking garage and state-of-the-art passenger services. Both complexes are conveniently situated close to New Orleans hotels and attractions. The Julia Street wharf complex is mainly used by Norwegian Cruise Line NCL and Royal Caribbean International RCL. Vessels from the Carnival Group anchor at the Erato Street wharf complex. Both terminals can accommodate the largest cruise ships and provide covered and secured parking spaces. Cruises depart from the Port of New Orleans to the Gulf of Mexico, Bahama’s or Caribbean (Cozumel Mexico). New Orleans has become a very popular departure port for Carnival Cruises, as well as Galveston in Texas. Main US cruise ports are Miami in Florida and Ft Lauderdale Port Everglades, where you find plenty of hotels within easy reach of the port. Many cruise passengers choose to stay close to Bourbon Street, Jackson Square and the French Market in the city’s French Quarter, where all the action is as far as bars, shops, and restaurants. In the heart of New Orleans’ fabled French Quarter you will find many intimate, historic hotel properties perfectly located in the center of everything and close to the port. 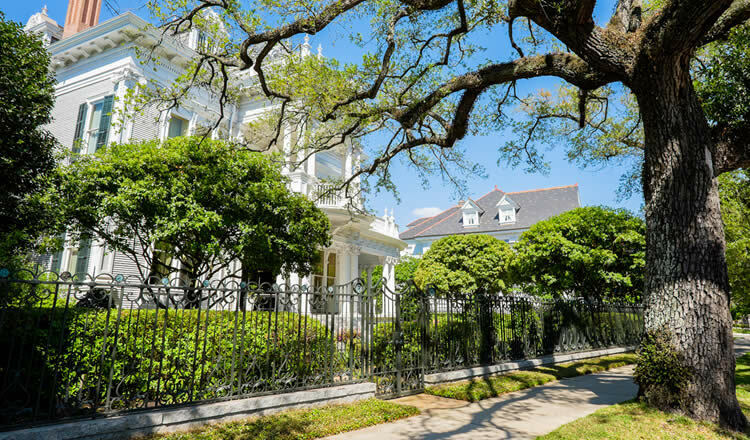 Another popular area is the Garden District, home to beautiful historic homes. Hotels in this area are more budget-friendly, some offer car parking as well. It’s a more laid back and quieter area of the city. St. Charles Avenue streetcar line, which offers transportation to New Orleans city centre and the French Quarter, is within easy reach. Louis Armstrong International Airport is located just over 15 miles from the port. Downtown is 20 minutes away. In this area you will many less expensive establishments, which offer you a free complimentary shuttle to/from MSY airport. When driving to the port, stay for the night in an nearby pre cruise hotel with car parking. The next day park you car at one the port parking lots. The Port of New Orleans offers two parking areas: The Erato Street Parking Garage and the Poydras Street Lot for over-length vehicles. Nearby Fulton Place garage is also popular by cruise passengers. New Orleans or NOLA is the biggest city of Louisiana in the heart of the Deep South of the United States. It lies at the legendary Mississippi River with its paddle steamers. The river flows into the Gulf of Mexico. Spend an extra day or two before or after your cruise. It’s a great way to experience “The Crescent City” or “Big Easy”. Whether you’re looking for a cheap motel or luxury 5 star hotel, we can help you find the perfect accommodation for your cruise vacation out of New Orleans LA. The city of New Orleans LA, also called NOLA, was founded in 1718 by the French, and sold to the US as part of the Louisiana Purchase. Visit the old colourful French Quarter and Bourbon Street with its creole architecture, small boutique hotels and vibrant nightlife. Restaurants serve Cajun and Creole dishes such as gumbo or jambalaya, traditional bars play your favourite jazz music. Stroll along nearby Royal Street, full of cute antique stores and art galleries. Check out the sidewalk artists or take a horse carriage ride from Jackson Square, which is dominated by the St Louis Cathedral. Take time to visit some of the cities best museums such as the Historic Voodoo Museum or the New Orleans Museum of Art. Families with kids will love the close by Aquarium of the Americas and the Audubon Zoo. If you like food, history and biking. A great way to explore NOLA is by bicycle. The Confederacy of Cruisers bike tour company takes you away from the French Quarter. You will have a blast learning about New Orleans history and food, while cruising through neighborhoods you otherwise might not have seen. New Orleans Louis Armstrong International Airport (MSY) — MSY airport is about 17 miles from the downtown piers. Airport shuttles, limousines and taxis are available at the airport. Additional cruise line companies offer transportation between New Orleans International Airport and the Port of New Orleans. Parking — plenty of safe and secure, car parking lots are located directly at the NOLA cruise passenger piers. There are additional off-site parking garages, most are short distance away from the terminals and require passengers to take a shuttle back to the pier. Secured parking at the cruise terminals costs $16 per day (subject to change). Making reservations is not necessary, unless you have an oversized vehicle (oversized vehicles are defined as any vehicle over 22ft in length and/or higher than 8’ 4”). More information e-mail hanksa@portno.com or call 504-528-3318. Take I-10 east to New Orleans; follow the signs to the N.O. Business District, US90 West, Crescent City Connection to the West Bank. Take last exit before crossing the Mississippi river, which is the Tchoupitoulas Street/St. Peter Street exit11C; turn right onto Tchoupitoulas Street, take a left onto Henderson Street(at the red light), proceed down Henderson St. past the railroad tracks and floodwall and turn left onto Port of New Orleans Place. Follow the signs into the appropriate terminal. Pre or Post cruise accommodation with (free) airport or (free) shuttle service to the pier — many hotels located close to the airport offer a complimentary transport shuttle service to/and from the airport terminal. Find the best deals to make your cruise holiday really special without breaking your hotel budget. Once you have the kind of port motels or hotels you want in mind, look for deals that fits your needs.